tammy gordon: native floridian. district denizen. frequent flier. wannabe surfer/artist/somm. recovering political campaign junkie. social media strategist and communications consultant. Last night, I went to a preview of the 2012 Fancy Food Show at a cute olive oil shop in Eastern Market. After tasting samples of some of the best new food products (you can try em at the show - ticket info here), I was ready for dinner. 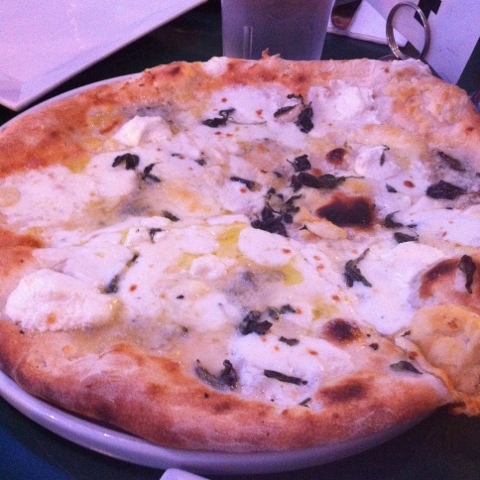 A posse of foodie gals decided to try the new pizza place around the corner, 7th Hill Pizza. Let's just say they had me at goat cheese, spacious patio and cute Italian pizzaioli. I had the Union Station (the 7th Hill spin on white pizza with goat cheese, mozzarella, pecorino, gorgonzola and garlic) and a simple arugula salad with shaved Parmesan. If you're in the neighborhood, it's worth a visit. 7th Hill is brought to you by the team that runs it's neighbor, Montmarte. It's located at 327 Seventh Street SE in Washington, DC and is just a block or so from Eastern Market Metro stop. You can follow them on Facebook for the daily specials. 7th Hill was a lovely surprise! So delish. Great dining with you, as always. I agree, Seventh Hill is good. But I wouldn't call a restaurant that opened in 2010 new, exactly.